TORONTO, Oct. 24, 2018 /CNW/ - First Cobalt Corp. (TSX-V: FCC; ASX: FCC; OTCQX: FTSSF) (the "Company") is pleased to report new drill results from its Iron Creek Cobalt Project in Idaho, USA. Results reported today demonstrate thicker cobalt mineralized zones as well as mineralization between the two recognized zones. "Today's drill results from our flagship asset support the development vision for the future of the Iron Creek Project. We now have three drill rigs on site for infill and extensional drilling as we work towards updating the mineral resource estimate in early 2019." Assay results reported today infill previous drilling in the eastern portion of both the No Name and Waite Zones (Figure 1). 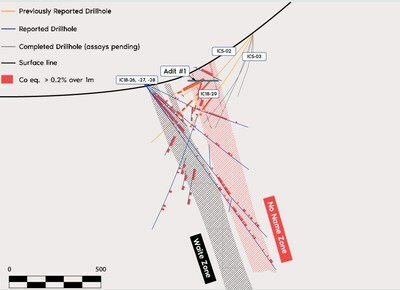 Drilling specifically targeted mineralization near surface around Adit#1 using a relatively tight spacing of less than 20m, which could be considered appropriate for Indicated Resource estimation (Figure 2). Surface and underground drilling from the eastern extent of the resource identified higher grades of cobalt and copper mineralization (up to 0.61% Co and 2.02% Cu over 2.7m true width) within broader intervals of mineralization in the No Name Zone. All six holes intersected cobalt and copper mineralization in between the two recognized zones, No Name and Waite. Based on the current drilling data, these mineralized intervals between the zones in the eastern portion of Iron Creek support development vision of the Company's pit constrained maiden resource estimate (see September 26 press release). More infill drilling is planned to test the continuity of mineralization in this area. 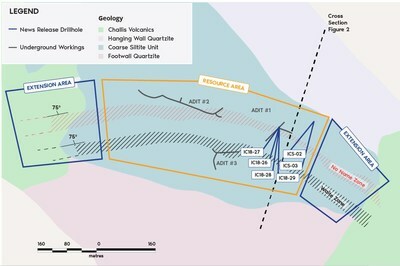 Assay results from each hole show a strong overlap of higher grade cobalt and copper mineralization in this area (Table 1). Overlapping intercepts of both cobalt and copper mineralization with higher grades contained within broader zones include 0.61% Co and 2.02% Cu over 2.7m in IC18-27 within 12.3m of 0.38% Co and 1.63% Cu and 0.60% Co and 1.38% Cu over 2.4m in IC18-28 within 18.0m of 0.30% Co and 1.21% Cu (Figure 2). In all drill holes, copper mineralization typically occurs with cobalt in both the No Name and Waite Zones. As seen in Adit#1, intersections of massive pyrite lenses are one to two metres thick as host to higher grades of cobalt. Massive sulphide mineralization characterizes the No Name Zone in this area. Chalcopyrite is also prominent with pyrite and as centimetre-sized veins in higher grade copper intervals. First Cobalt announced on September 26, 2018 an Inferred Resource estimate at Iron Creek of 26.9 million tonnes grading 0.11% cobalt equivalent (0.08% Co and 0.30% Cu containing 46.2 million pounds of cobalt and 176.2 million pounds of copper) under a base case scenario pit constrained and deeper mineral resource. An alternative underground-only scenario results in 4.4 million tonnes grading 0.23% Co and 0.68% Cu (0.30% CoEq) using a cutoff underground grade of 0.18% CoEq and containing 22.3 million pounds of cobalt and 66.7 million pounds of copper. The Inferred Resource is based on drilling over a strike length of approximately 500 metres and a dip extent of over 150 metres. Preliminary metallurgical testing concludes that simple flotation methods are applicable, yielding recoveries of 96% for cobalt and 95% for copper in rougher floatation. Drilling is ongoing to extend the strike length of the mineralized zone from over 500 metres to over 1,000 metres and test down dip extensions of known cobalt-copper zones from 150 metres to over 300 metres below surface. In conjunction with the recent appointment of Ryan Snyder as Chief Financial Officer for First Cobalt, certain directors and officers of the Company have been granted incentive stock options to purchase an aggregate of 400,000 common shares of First Cobalt exercisable at a price of $0.27 for a period of five years. The grant of options remains subject to the approval of the TSX Venture Exchange and the requirements of the Australian Securities Exchange.